When I was 11 years-old I did a terrible thing. I shoplifted a Sweet Valley High novel from my neighbourhood discount department store. It was spring time and my jacket had these giant pockets on the front perfect for slipping a paperback novel into. I don’t remember what volume of the series it was. Most likely something to do with Jessica getting herself in trouble and Elizabeth needing to bail her out. You know, like almost all of the novels in the series. 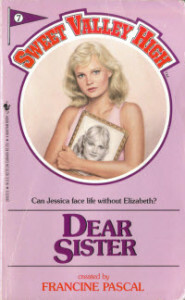 Although in Dear Sister, Elizabeth and Jessica kind of switch personalities… That novel was one of my favs. I was filled with trepidation when exiting the store. But no one stopped me. I was actually quite surprised by this. But I guess no one was paying much attention to the girl wearing the large-pocket white spring coat hanging loitering around the paperbacks section. On the walk home I felt relief at not getting caught and excitement at having a new book to read, albeit undeserved. And I knew it was undeserved because coupled with that relief and excitement was a tremendous feeling of guilt. Because I knew better. Did I confess and bring the book back? No. And no one found out about me stealing that book. Until…well, now. Not proud of this shoplifting story. Not proud at all. I was an avid reader as a child. Money was tight in our family. And while the library was in walking distance it didn’t have the latest and greatest in the Sweet Valley High series. None of these reasons are a valid excuse for taking a five-finger discount that spring day. Not at all. Just fact. And poor decision-making. We all have un-proud moments in our histories. Perhaps not about shoplifting but rather some other less than a stellar example of human goodness. This story is one of mine.